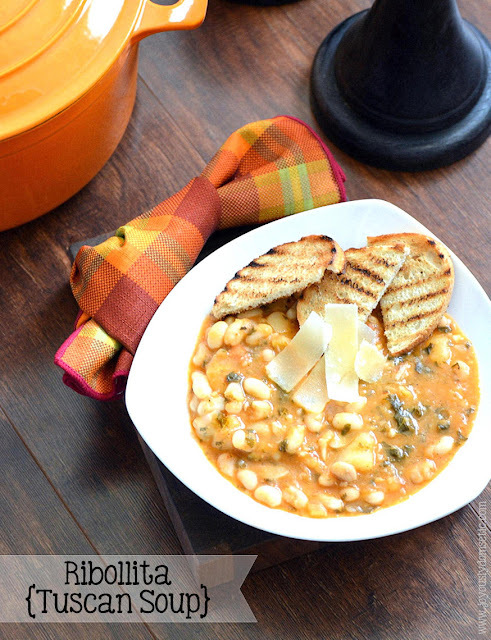 Ribollita is a hearty Tuscan soup. There are many variations, but most recipes include beans, vegetables and bread. I've, basically, declared it my new favorite comfort food recipe of 2016. I think you'll find that it's a great new soup recipe for you to try out this year ... and one that you'll come back to time and time again once you've tried it. Soak beans in cold water overnight. Drain and rinse. Heat 1/4 cup olive oil in a heavy-bottomed soup pot over medium heat. Add in onion, garlic, carrots and celery. Stir and cook until slightly softened. Add in potatoes, 2 cups of the cooked beans, 4 cups of the cooking liquid, tomato sauce and red pepper flakes. Bring to a boil. Rub grilled or toasted bread with peeled garlic cloves. Serve with soup. Top soup with cheese and a drizzle of olive oil. Author's Note: Soup can be served immediately. However, the flavor is improved by allowing the soup to "rest." It is recommended that it be removed from heat, covered and allowed to sit for a minimum of two hours, but up to overnight prior to reheating. If serving the following day, store - once covered - in the refrigerator. At time of service, bring soup to a simmer over medium heat. It may be necessary to add in a little water when reheating if the soup is thicker than you prefer.